Published on 10 November 2012. 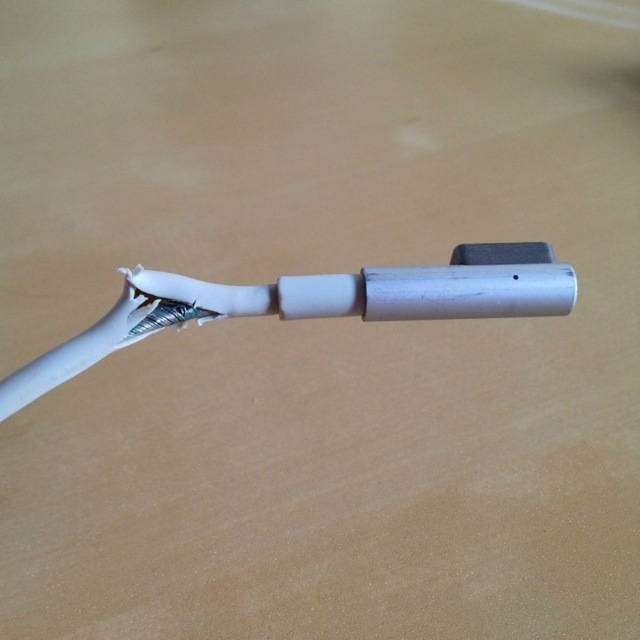 After two-and-a-half years of constant use, this happened to my MacBook Pro’s power lead. I’m not sure when it happened, but I noticed it yesterday evening. And so this morning I paid my second ever visit to the Genius Bar in my local Apple Store, where it was replaced on-the-spot with no questions asked – not even how old it was, or whether it was under warranty, or whether I had AppleCare. It’s such brilliant service, especially compared to spending £50 on a replacement cable for my last Toshiba laptop after a similar lifespan. This 1,885th post was filed under: Photo-a-day 2012, Apple, Retail.